Our investors access their portfolios and view their performance through the Amphora Vaults website, which is a portal to the software system of Vine; Liv-ex’s wholly owned storage facility. It goes without saying that Vine is a temperature controlled, highly secure and clean warehouse space, and that the wine is fully insured. 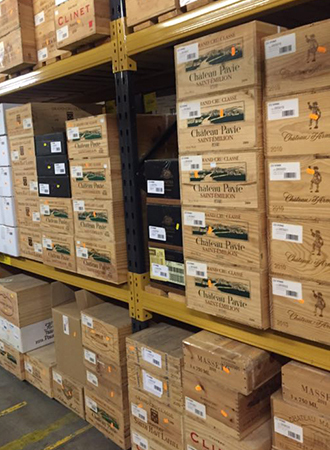 But the vine storage system goes further, and the team have been busy re-defining standards and processes in the fine wine supply chain and storage. Private clients are not normally able to utilise Vine; it’s for the trade only. But by merit of the relationship with Amphora Vaults, we can offer our clients unique access. Most importantly, Vine will hold independent records of ownership, making it is very straightforward for Amphora’s clients to establish good title. We cannot overstate the importance of this from a security perspective. If you have wine to store but are not currently a client of Amphora, you would nonetheless be most welcome to store your wine at Amphora Vaults. We endeavour to maintain highly competitive rates. Please contact us for current cost per case.